The Boulder Group releases its 3rd Quarter 2018 Net Lease Medical Report. 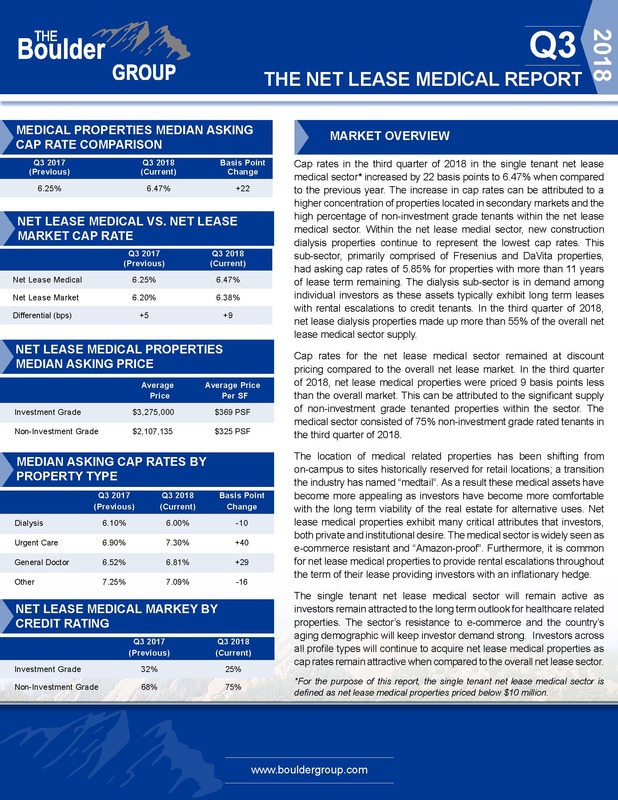 The report provides comprehensive numbers and analysis of the net lease medical market. 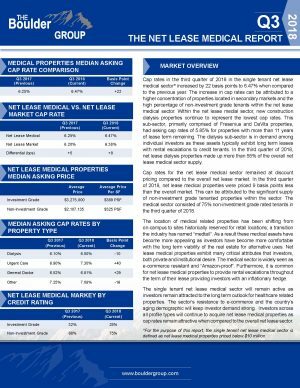 Cap rates in the third quarter of 2018 in the single tenant net lease medical sector* increased by 22 basis points to 6.47% when compared to the previous year. The increase in cap rates can be attributed to a higher concentration of properties located in secondary markets and the high percentage of non-investment grade tenants within the net lease medical sector. Within the net lease medial sector, new construction dialysis properties continue to represent the lowest cap rates. This sub-sector, primarily comprised of Fresenius and DaVita properties, had asking cap rates of 5.85% for properties with more than 11 years of lease term remaining. The dialysis sub-sector is in demand among individual investors as these assets typically exhibit long term leases with rental escalations to credit tenants. In the third quarter of 2018, net lease dialysis properties made up more than 55% of the overall net lease medical sector supply. To download the complete report, please click here.